Work Sharp has teamed up with renowned knife maker KEN ONION to deliver the ultimate sharpening solution for your home or workshop. 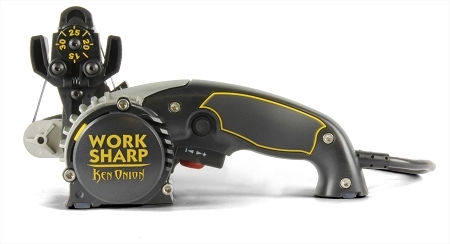 The Work Sharp Knife & Tool Sharpener - KEN ONION Edition will sharpen every scissors, shears or knife you own, quickly and easily. The KEN EDITION version of Work Sharp Knife & Tool Sharpener is an abrasive belt sharpening system. 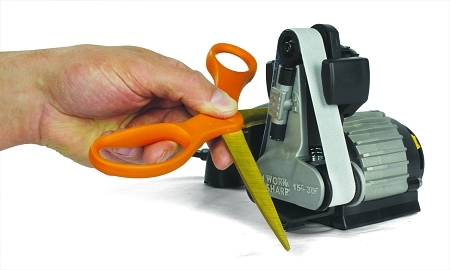 Using flexible abrasive belts, the sharpener is able to sharpen not just straight bladed edges, but also curved knives, tanto blades, filet knives, serrated knives, gut hooks and virtually any other shape of knife and scissor blade. The Knife & Tool Sharpener uses precision angle sharpening guides to ensure that you get the proper angle every time with precision and repeatability. Two guides are included in the package: a 50° guide for hunting and outdoor knives (25° per bevel) and a 40° guide for thinner blades and kitchen knives (20° per bevel). Professional knife makers use flexible belts to put a razor sharp edge on their blades, and now you can have the same technology at your workshop or home to use any time the blades get dull. You may already have other sharpening methods, but never before has a sharpener been able to quickly and easily sharpen this broad range of knives and scissors to such extremely sharp results. All of Ascend Tools' shears can be sharpened (non-serrated blade only). Currently, this sharpener is being used by riggers and sail-makers to sharpen our ATi-801, ATi-803 and ATi-802 shears. It can also sharpens scissors and many other bladed shop tools and garden tools; like our GLE-521, GLE-523, GLE-525 & GLE-527 garden tools. The product comes complete with two coarse, two medium and two fine abrasive belts. It can also sharpens scissors and many other bladed shop tools and garden tools. This tool is assembled and quality tested in Ashland, Oregon.